As someone who has not only spent the past two years studying hospitality, but has also worked in hotels, I have never experienced something like Waqoo. 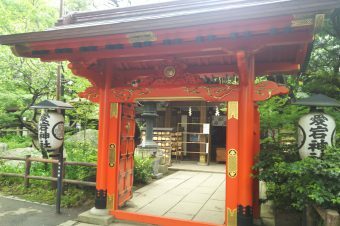 Located in the Tennouji prefecture of Osaka, Waqoo Shitaderamachi offers what is known as Shukubo. 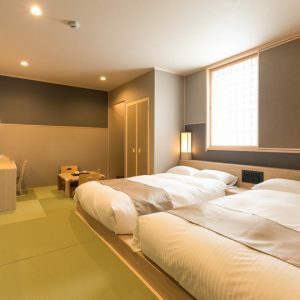 For those of you who are unfamiliar, Shukubo blends together the experience of staying in a temple but with the comfort of a hotel. One of the major things that sets Waqoo apart from other Shukubos, however, is its accessibility for English speakers. This helped me not only truly enjoy my time at Waqoo, but also allowed me to feel that I got the most of my experience by having these resources. The experience starts when you arrive to check in at the front desk. From here the staff will have you sign the standard hotel paperwork, but along with that they will also present you with a schedule. This schedule gives you a few options for activities that you can participate in at the hotel. 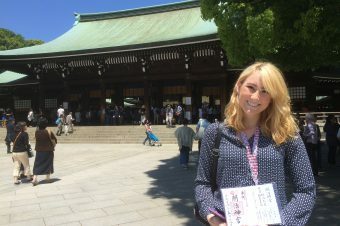 They range from traditional temple activities to selecting the time to enjoy dinner and breakfast. We arrived a little later in the night, so we immediately headed to our room to drop our bags off and from there we headed straight to dinner. 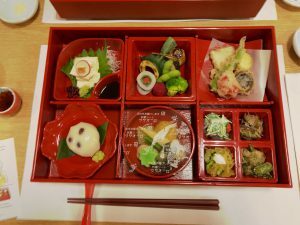 When I first heard that we would be having a traditional Buddhist vegetarian meal, I was a little less then ecstatic to say the least. However by the time dinner arrived I was pleasantly surprised. 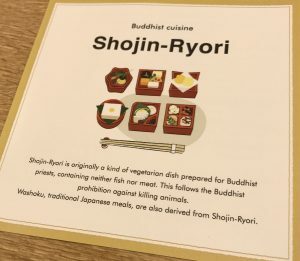 Along with the delicious food, they provided a menu in both English and Japanese along with informational cards that not only describe the importance of the cuisine, but also informs you the proper prayer to say before and after the meal. While we were feasting, we were able to talk to some of the hotels staff. After dinner we had a little time to rest and from there it was back down to the main area for the evening activity. Of the two options I decided to try sutras. 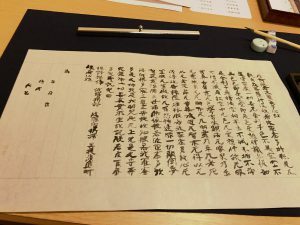 At first sutras can seem very intimidating especially if you’re like me and have never done calligraphy before, but the head monk made the entire process a lot less intimidating. All together the sutras lasted for close to an hour and I not only found myself enjoying it, but I also found it incredibly relaxing, especially after a long day of traveling. 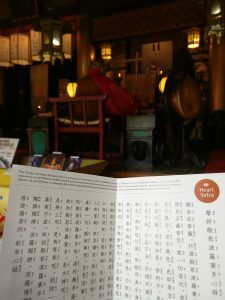 Once you finish tracing all of the Chinese characters, you’re given the option to either take the paper with you or leave it with the monk. Once we were finished we decided we would head to bed since we had to be up early for the next morning’s Otsutome. 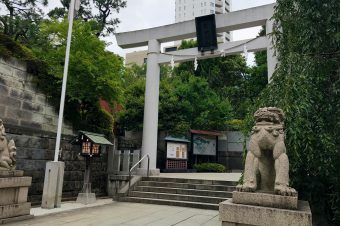 For those of you that don’t know what Otsutome is, it’s a daily religious services where they read sutras and worship before a Buddhist altar. This is part of a practice that monks conduct at their temple each morning; to be a part of it was an incredibly rewarding experience. The event started bright and early at 6:45 am in the hotel’s lobby. 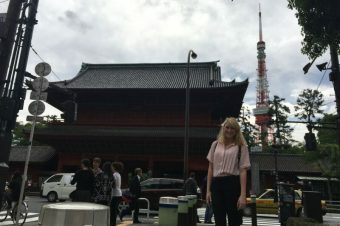 Once everyone arrived, one of the hotel staff members led us on a five minute walk to a nearby temple. Upon arrival, we took a seat at the temple’s main hall. From there the monk greeted us and passed out pamphlets of sutras for us so we could follow along with the monks’ chants. One of the best things about receiving the sutra was that it featured an English translation, which is something I have never seen before. The entire Otsutome lasted around 30 minutes, and among other fascinating aspects, it featured the burning of goma wood. This was an incredible experience and it may have even been the highlight of my stay at Waqoo. 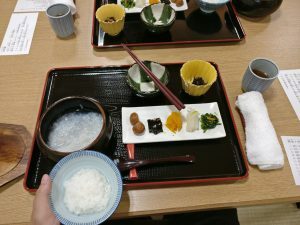 Once the Otsutome ended we headed back to the hotel where we received a traditional Buddhist breakfast. Afterwards, we headed back to the room, packed up our belongings, and went to the lobby to check out. The process was standard, but on our way out they handed us two small gifts for us to take home. The first gift was a small pouch of rice that was blessed by a monk. 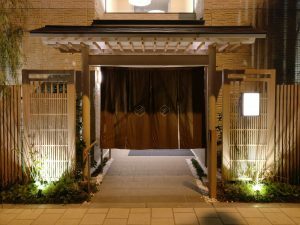 The second gift was an omamori, which is a Japanese amulet in a bag that is said to provide good luck or protection (don’t open the bag, it’s considered bad luck!). 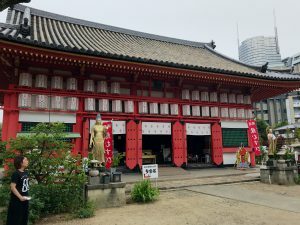 Overall my stay at Waqoo was truly a unique and incredible experience that I highly recommend to anyone who visits Osaka.